or What should you do? Aha! Mexico is a Belt and Suspenders kind of country, eh? . . . (cont) . . . 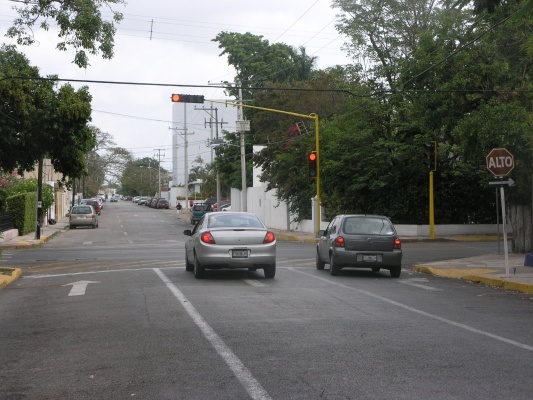 This entry was posted in Uncategorized and tagged driving, driving in Mexico, living in Yucatan, Merida Mexico, Mexico, stop light, stop sign, visiting Yucatan, Yucatan, Yucatan Mexico. Bookmark the permalink. 2 Responses to Mexico Driving: What would you do? I’ll say this about driving in Yucatan: the locals are becoming much better drivers as they gain experience. When I first started driving in Yucatan, there would be at least ten cars in the ditch in the morning from the the night before and not just on the weekends. They even had trouble staying on their side of the road in the corners. You seldom see a fender bender now. The signage can still be a crapshoot but if you drive like they all want to kill you, you’ll be fine. I think driving in the big American cities is more dangerous than driving in Merida. I’ve (naively) been thinking that the drivers here have a lot to learn, and now you tell us that it was worse in the past. The middle aged women in giant SUV are the ones that terrorize me when I’m riding my bicycle. They seem to have no idea how far the right side of their land yachts extend, and they used to almost force me into the parked cars. I still have problems with old Yuco men, who come up behind me and blow their horns to scold me for riding on the wrong side of the street.